It's just one of my examples I teach to apprentices at the office when it comes to learning scrips, and how important data input validation (or the absence of the same) is. It's also a good illustration on how attackers may break into systems to steal data or make them part of a botnet. Did I mention it's insecure as hell? 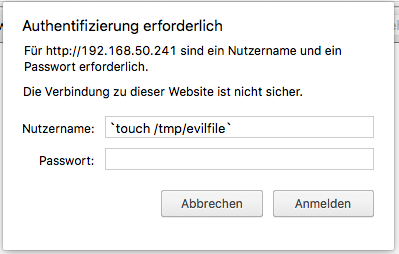 So, this illustrates how easily remote-holes can be opened by omitting input validation. Think about it twice! What would have happened, if an attacker had actually ran this second file? The whole contents of the hard disk would be just erased!Assuming any malicous attacker could exploit this, it's only a matter of choice to delete or extract any data. Or the worse, install some malware, and turn an innocent server into a bot of a much larger botnet. This in turn could then serve as a legion to attack others.And this is exactly, how it works. 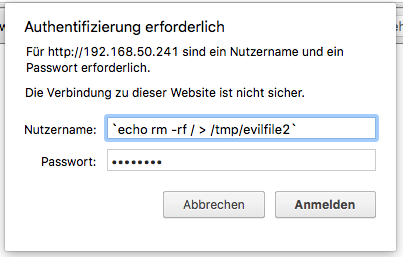 Yet it's important to note that, when a system urges you to do a "baschtel" (swiss german word for quick and dirty, evil and ugly hackery), it may be better to replace it. So, in this example, lighttpd is hindering the proper use of PAM. So, why not scrap it an use nginx or Apache instead? Maybe it's better to invest these extra 10 minutes to get a proper and well-working solution, instead of doing a hack, which endangers the whole system?